Capt_Teek wins this month's coveted Member of the Month award for his superior recruitment efforts, skillful captaining, and overall positive attitude and activity. Capt_Teek has bolstered our numbers by recruiting several World of Warships recruits this past month. Capt_Teek has also been a regular and recurring member of Hydras Company's efforts in WOWS's Clan Battles mode--he has been voted #1 WOWS player within the Fighting 13th unanimously by everyone here...or so we've heard . In all seriousness, Capt_Teek displays an abundantly positive attitude, and it shows in how much the WOWS group adores him, and in how well he is able to recruit fellow sailors. He is open-minded and he takes genuine pleasure in being able to assist in any way he can, especially new folks. With all this being said, we would like to give Capt_Teek a hearty congratulations on winning MOTM! With the release of Battlefield V on November 20th, our newest unit, Red Devils Company, has been established and has already swelled to 57 current members as of this typing, with 2 or 3 coming in every day or so wishing to play with or join. Named for the British 6th Airborne Division which famously fought in Arnhem during Operation Market Garden, we aim to model ourselves after them using cunning tactics and tenacity to beat and out and route our enemy. @BillyBantam is taking charge of the helm of Red Devils with @copat149 at his side. We welcome all of our new members and recruits, and urge everyone in "Recruit" status on Discord to apply on this website to formally join the Fighting 13th. Perks include shiny tags, being considered for Member of the Month, awards, recommendations, prizes, a sense of belonging and other cool stuff. On December 5th, the first content drop was released with the Chapter 1: Overture update adding in checks and balances as well as a new map. On December 6th, the Tides of War will start and along with it brings us new assignments, equipment and customization options to work towards. Our members, recruits, and anyone else who has the urge is welcome to join us Sundays and Wednesdays for SQUAD UP to play the game together and have a good time. We would also like to remind our new recruits and members that we actively encourage you to be a part of the community at large and participate in community events like Secret Santa, or just join in on our lively, albeit sometimes strange, conversations in the main chat or discussions on the forums. Thank you to everyone that has joined us thus far, and we are looking forward to continued growth and excitement for Battlefield V and our community. See you on the Battlefield! Scenes like this in BFV evoke images of 'Saving Private Ryan' and other movies. P.S. Please post your Origin usernames HERE and be on the lookout for discussions in the Battlefield V forum HERE. Signups for Secret Santa can be done through THIS topic. The deadline for signing up will be December 13th! The Steam Winter Sale supposedly will start on December 20th and run for two weeks. We ask all participants to update their Steam Wishlists now. Secret Santas should buy and gift their present through Steam by January 2nd. If you are interested, please contact @Danius and @BillyBantam for more information, or ask away in the signup topic. Give a gift, get a gift, and earn a ribbon doing it! Leadership has decided to close down our Star Citizen unit, Advocacy Company. Interest in the game has fluctuated in the past, but at the moment is comparatively low. We will still be playing casually, and we will still be looking forward for updates as the game's development progresses. This is not a goodbye necessarily--more a "See you later." Deathdealers Company has been on a continued break this holiday season to accommodate players who are spending time with their families, as well as to allow time to enjoy new games that have released this past month. On December 18th, we will be holding our Christmas event to celebrate the holidays with everyone. We would like to welcome the presence of members both old and new to enjoy the holiday spirit with *Operation Dark Claus* where we will hunt down the elusive Santa Claus and his Elf Team Six in the Arctic North. This will be our last mission of 2018, and we look forward to running it with you all. Please RSVP! The ARMA III server swap-over was done successfully, and we have laid to rest our old server this past month. 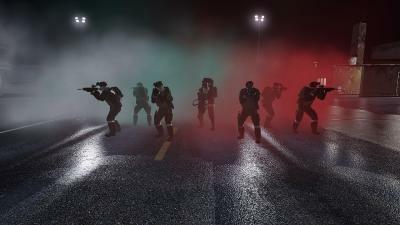 We will be starting regular Tactical Tuesday installments again every week at the beginning of the New Year in 2019-- we have a special mission set planned to kick everything off and we hope you are looking forward to it as much as we are. If you have any questions about what you need to do to join an Arma operation, how we operate, or any general questions regarding the game or our missions, please feel free to ask in the #deathdealers chat on the Discord server or PM @cJack or @copat149 with your questions. Also, we would like to give a shoutout to an old member who has returned with a fiery passion, @LeChefOmega! He is always excited and ready to play any op he can regardless of his past performance issues with the game. Hopefully, his new rig will put his poor FPS in the past and make him an Arma 3 pro! Teaser pic from the upcoming Operation Dark Claus event. Patch 0.11 will be released this year, for sure. But it will be downsized a little bit. For example there won't be UP/DOWN outfit change, transfered to the next patch. Patch 0.11 content: New Map; Killa; Guns (RPK 16 / HK-416 / Mosins / Remington 700 / AR-15 civil version ADAR / VEPR Hunter / SVD maybe / New Melee; New NPC "raiders" likely. Hideout is 98% ready. Highly likely next NY patch. Arena - this is release endgame content. Nikita designed it a year ago, but it will be added with release of the game. Will be 1 on 1 / 2 on 2 / 5 on 5 / PVE mods and couple unique game mods. Will include 5 special Arena locations. One is ready 4 to go. Player will recieve "reputation points" for it. Next scav boss after Killa will be on woods. Hunters gang. New maps will be realised much faster. Almost all content is ready. 2 maps in 2-3 months. Ratings - new season is on. Nikita told there will be gifts for top rankers. New NY gifts for players. Unique clothes for Beta and Alpha testers after release. We cannot wait for what's in store with EFT. As always, check out the #hideout chat on Discord or join the Escape Room to squad up and kill some scavs with us! Contact @[13th] Exiduslol, @Scags, or @Daytex for more information. Shrouded Spoils, the latest update, gives players a more "surprising" experience in Sea of Thieves, at least according to Kotaku. The latest update gives old foes new tricks by making enemies more plentiful, and kraken more slamming. Enemies also drop way way more loot and grant special commendations that can be spent on unique gear such as a golden cannons or a barnacle-encrusted ship hulls. For a while, enemy encounters were rare but Shrouded Spoils makes monster hunting an entirely viable activity for players sick and tired of digging up buried treasure. As always, come join us to experience the life on the high seas like we see it! Contact @Chris P Bacon for more information. The WOWS group was still in its off-season phase until November 28th when the latest Clan Battles season started. Hydras Company (EU) has used the off-season to strengthen its roster and hone its skills. The next month will hopefully see us reach our minimum goal of getting Gold III ranking and hopefully pushing higher. The WOWS group's excitement for Clan Battles really showed--the group mustered 10 members the first day and 12 members the day after. With a few more of our players active, we could possibly be running two teams of seven this season which would be huge progress from hardly being able to muster seven members daily last season--Its competitive section will henceforth never be known as "THE NEVER SEVENS" again! If you are curious to see the status of Hydra Company's and Stingray Company's battles, check the #na_harbor and #eu_harbor chats on Discord. Also, to aid in our fearless Captains' battle management efforts, please post your Tier X ships HERE and check out the other topics in the World of Warships forum HERE. In addition to the WOWS group's continued success on the war path, the WOWS group also has had a steady influx of new members recently, thanks in large part to @Capt_Teek. Thank you Capt_Teek! Also, please congratulate @Pman on stepping up to lead the NA side, Stingrays Company. He has proven himself over the last couple months and we expect him to do so further in the time to come. Please contact him or @5wi55_ch3353. (Hydras Company EU) for more information. Screenshot from @Dirty Andy showcasing the might of the WOWS group. This section will highlight games that are on our "watchlist" of potential games we want to get into. It is so close to releasing, we can almost taste it...Folks, that's right, release date is just around the corner on December 12th! You can try out Insurgency: Sandstorm's Open Beta December 7th through December 10th. Check out Raven's event for INS this Friday, December 7th HERE. Contact @Raven and check out THIS topic for more information or to ask any other questions. Raven will be taking lead of our INS squad. War of Rights went into Early Access mode December 3rd. Dayz may be coming out of Early Access. @Rorschach grew a mustache for movember...demand a picture! @ser_munchies will now be known as Bronx's personal medic. @Jason99vmi, @BirdDog2043, @Jfranklin94 have been marching to the beat o' the drum with War of Rights releasing into Early Access a few days ago. 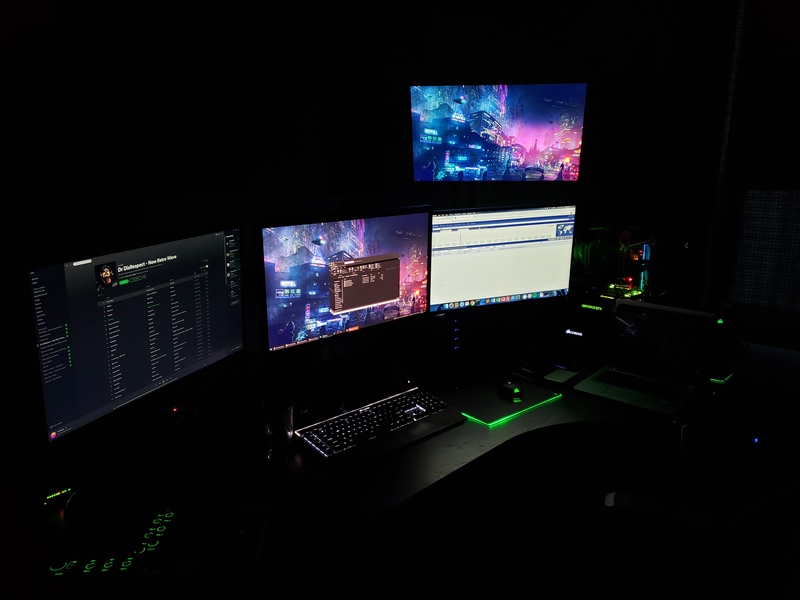 @ARM0R3R shows off his Tactical Operations Center Gaming Center. @Lt_Tickledik and skidmarkwalburg (pester him to signup) are competing in the "Best Name" competition. @Danius evolved into an emoji. Another great write up, and another good month here with the Fighting 13th. To many to mention you all. Welcome to the 13th. If any of you are looking to scratch that Arma itch we always got room in our custom missions with the Deathdealers. Hit me up. RIP Advocacy... That is why I originally joined the 13th, but found so many other great games to play with you all!